Tells the story of three men--Bluey, a tough two fisted drover (Taylor), Milo, a laconic dingo trapper (Rafferty), and Pete, an intellectual English "new chum" (Finch). Together they serve in North Africa, fighting against the forces of Rommel in what has now become one of Australia's greatest wartime legends--The Rats of Tobruk. 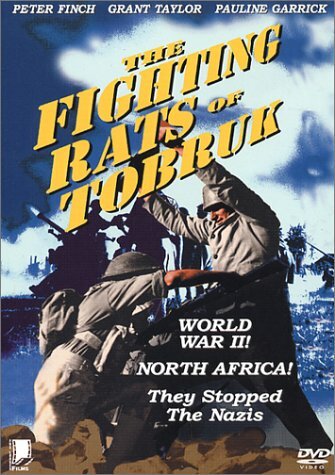 THE RATS OF TOBRUK is a dated but watchable Aussie WW2 movie, of which there aren't too many in existence. The story follows a trio of characters as they head off to fight Rommel on North Africa. Grant Taylor is the square-jawed lead, Chips Rafferty adds character, and Peter Finch is the upper-crust Englishman. The film is a little slow to start with a lot of ponderous conversations and tacked-on romance, but once the action shifts to Africa it incorporates plenty of documentary-style realism in the depiction of intense battles. What's impressive is that this was made while the war was still in full swing, with a number of the cast on leave from their roles in the forces. I guess this is in the public domain as its out on DVD. First off, this is a feel good propaganda movie to be shown to a wartime Aussie audience, so its not to be considered a serious retelling of Tobruk. The first half to 3/4 is very dry stuff set in Australia, I guess like many American war films where the recruits are getting together, oh man its soooo long. Than we get to Africa and Tobruk, pretty bad, low budget stuff. The battle scenes on the DVD copy I watched were almost completely black. See it if you must, but be prepared to use the fast forward as I doubt you can take it after a few minutes. I enjoyed the cheesy Italian "Battle of El Alamien" a whole lot more, also Richard Burton did an African theater war flick that was good "The Desert Rats", this movie is just a real period piece and should have stayed in that time, does not hold up well today (I doubt it was highly regarded back then either). I say the same thing about my American counterpart war flicks so don't take it personally Aussies (I love Australia, been there twice! ).